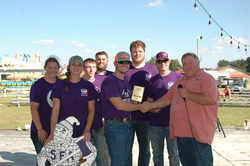 Members of the Stephen F. Austin State University timbersports team, the Sylvans, won the second annual Lumberjack Match held at the Ouachita County Fair in Camden, Arkansas. During the competition, the Sylvans competed against three other universities in a series of physical timbersport events. Pictured from left are Cheyenne Tant, Katie Adams, Blaine Turner, Dr. Jeremy Stovall, Brody Capps, Ian Erickson, John Mike Arnett and Keith Ballard. NACOGDOCHES, Texas - Members of the Stephen F. Austin State University timbersports team, the Sylvans, personified the university's mascot during the second annual Lumberjack Match held at the Ouachita County Fair in Camden, Arkansas. The Sylvans placed first in men's crosscut sawing; men and women's bowsawing; Jack and Jill crosscut sawing; single buck crosscut sawing and knife throwing. The team took second and fourth place in women's crosscut sawing and axe throwing, respectively. "Our students were professional and did an excellent job representing the university and the Arthur Temple College of Forestry and Agriculture," said Dr. Jeremy Stovall, associate professor of forestry at SFA and Sylvans faculty advisor.